I will get back to writing about my Hawaii trip soon but I need to make a short detour to describe my last week and a bit. 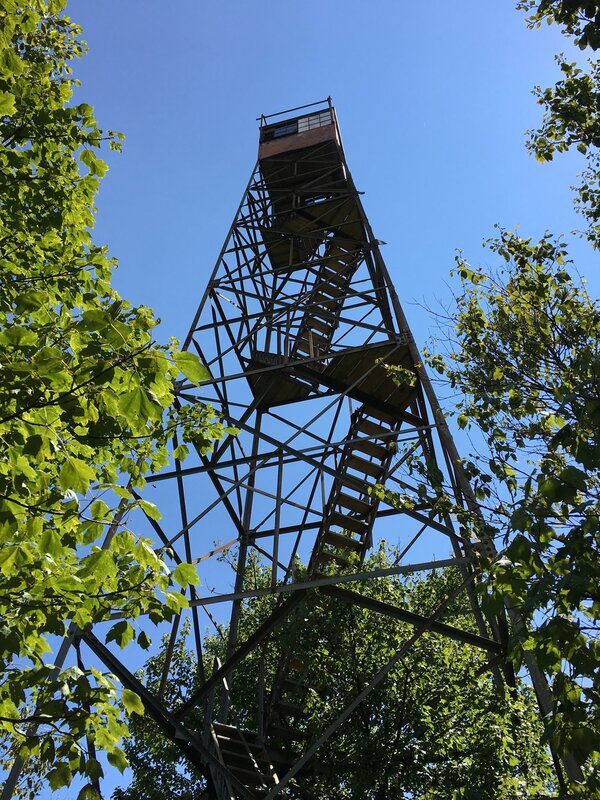 This was my second attempt to hike up to the Shuckstack Fire Tower which is located near the Fontana Dam in Western North Carolina. I had attempted the same hike last winter but due to starting out later in the day and underestimating the effort and the quickly dropping sun I had turned back. This time around I knew that I had plenty of time to trek all of the way to the tower. I arrived at Fontana Dam around 11am and crossing the dam via vehicle so I parked at the dam parking parking and began my journey (this would tack on an extra mile or so on both sides of the hike). It was really hot and sunny when I started crossing the dam but I brought along plenty of water so I powered up to the trailhead. As soon as I was under tree cover I was feeling much better. Well that was until I started to hike up the trail proper. I was severely out of shape but I persevered. I met probably two dozen people along the trail heading in both directions. This is a very popular section of the Appalachian Trail. After approximately three grueling hours I reached the tower. I doffed my backpack and relaxed for a good five to ten minutes mainly attempting to regain my breathe and composure. Then I made my way, carefully, up the stairs to the top of the tower. The stairs were very solid but the room/platform at the top of the tower seemed a bit sketchy. I didn’t feel like it was going to break apart but there was a bunch of broken glass and nails and what not. I made my way carefully back down the tower and then collected myself and started the trek back down the mountain. Although I wasn’t panting as much my body was already in a weakened state and the jarring downhill motion caused me quite a bit of pain. I eventually made it to the bottom of the trail and the last mile to return to my car seemed like it would never end. The night after my hike and for the next few days my legs were extremely sore. I could barely go up or down stairs and even getting out of a sitting position took extra effort. Pain relievers and rest and I mended up fine. I just used the pride that I accomplished one of my goals to keep me going. As everyone and their grandmother in the United States knows there was this awesome solar event that happened a week ago that has been dubbed the Great American Eclipse. I have a house in Western North Carolina which was directly in the Path of Totality. This provided an excellent excuse to meet up with my parents and experience this potentially once in a lifetime event. We attended an Eclipse Party/event/gathering hosted by the Carolina Bound Adventures. Mark and Bernie did an excellent job of hosting this gathering as the moon blotted out the sun. I took a time lapsed video of the event during the eclipse. Also during the totality I used my DSLR and got a few shots. It was amazing. The light dropped into a weird shade of twilight. The breeze kicked up. We didn’t really experience any odd animal behavior (other than humans howling). But we all had a blast. Afterwards we all headed down to Independence Lodge where we played games and ate an amazing meal. Again a huge thanks to Carolina Bound Adventures for organizing such a great day around an amazing event. The rest of the week I worked during the day and hung out with my parents in the evenings. We went to Cherokee one evening to see a movie at the theater there but prior to the showtime we ventured to the edge of the Smokey Mountains National Park and took pictures of this awesome elk. We saw The Hitman’s Bodyguard which was a hilarious action comedy. I highly recommend it. We also played many games of Settlers of Catan and a few games of Suspend. Finally, my parents and I capped off our time together in the mountains with a hike up to the top of Double Springs Development. I saw a decent sized buck almost at the summit but he ran off into the wood before my parents were able to catch up to me. Friday afternoon I drove to Nashville to attend an Ingress event, 13 Magnus Reawakens. As I said before I’ll have to write an entire post about Ingress but until then dear reader you will have to imagine a game that people all over the world play together on their phones. In this case a large group of people from all over the country (but mostly from the south east) merged in Nashville for a 4 1/2 hours of chaos. The night I arrived in Nashville I checked in at my hotel. I then went and checked in at the event headquarters. Afterwards I ventured to the downtown area to attend a meet and greet with fellow members of my team, the Resistance Faction. We met at Bourbon Street Blues and Boogie Bar and I ate some very delicious shrimp and crawfish étouffée. We were entertained by Derek St. Holmes. A great time had by all. I met up with my squad who had just arrived from Sarasota, FL but I didn’t hang out with them too long because I was tired. I grabbed a quick breakfast at the hotel and then headed downtown. I wanted to try to get a general idea of the area before I rallied up with my squad so I walked around playing and observing. Nashville is a very lively city. I grabbed lunch at Sbarro’s (I know but I wanted something quickly and I wanted to eat in air conditioning). I then met up with my squad that were just finishing lunch themselves so we sat and talked a bit about strategy and tactics for when the anomaly started. We struck out and marched to our first location where we split up to attempt to cover more objectives. It was a tough battle but we were able to do some good. We then moved to our second mission but the intelligence that we were receiving was mediocre and I, at least, felt useless. I decided to head off to attempt to take down some targets on my own. No one objected so I was off. I hiked around Nashville dropping every target that seemed important. after about an hour I rejoined my team. The event ended and we went and grabbed dinner. Tired and frustrated from fighting so hard only to lose we bonded over the misery. I then broke from the group to go to the after party at the Whiskey Bent Saloon. I gathered together with many members of my team as we commiserated together over drinks and good music. There was even a marriage between two Resistance agents at the event. It was a good and crazy time. The day caught up with me so I departed and returned to my hotel. There was a second day of Ingress activities called a Mission Day. Basically it is an excuse to use Ingress to explore a city and highlight some of its main sites of interest. I knew that I had to leave Nashville early enough to get back to Charlotte before midnight so I started rather early. I walked around the downtown area and then drove to some of the nearby communities in order to complete the objects related to the Mission Day. I then decided that I would grab lunch and chill until I could confirm my objectives with the Niantic staff at the Famous Saloon. I ended up hanging out with a couple that I know from the Charlotte area. It was a good time. After I finished lunch and checked in I bounced and drove back the 7 1/2 hours to the Charlotte airport where I swapped vehicles and went to the hotel and passed out.